As the name itself suggests, the Solar Plexus or Navel Chakra is located at the navel region of the human body. This is the chakra which controls the basic inner character that a person possesses, including all the body’s energy and raw power. The Manipura Chakra is said to play an important role in helping a person’s digestive system, and converts food particles into energy that moves the entire body. 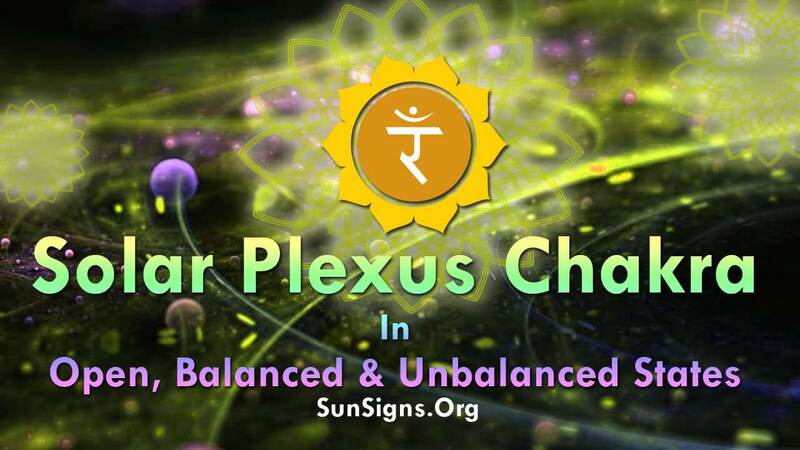 The open state of this solar plexus chakra reveals to you as a very balanced human being. You are told to possess a high amount of self-esteem and your confidence level also touches a new high. You will be the quickest to ascertain your views and gain control within a group, and will be looked upon as a natural leader. In this chakra’s open state, your emotional life is entirely fulfilling, and you tend to look at things from a broad perspective. This emotional fulfillment means that although you constantly stay in control, you are seldom perceived as domineering by others. Daring and confident, you become a natural leader, and do not hesitate to take risks. You seem to have actually found your place in society. On the other hand, if this Manipura chakra is in an under active state, it is likely to make you inactive and doubtful to take up any new life initiative. You are viewed by friends and family as passive, and even a timid individual. There always seems to be some kind of underlying fear in your mind, which prevents you from taking that first step. During this stage, your emotions seem to have besieged you, and all that you feel are superficial emotions. The inner feelings are very subdued at this stage. At times, it may lead to a serious crisis and you may be found to be suffering from delusions, you need professional help at this juncture. Lastly, if this solar plexus chakra lies in an over active, it may lead to the desire to become all-powerful in society, making you something of a megalomaniac. You may express serious dominating tendencies, which might make you an awful person in the eyes of others, especially your subordinates. At the same time, you become very aggressive in your behavior and your entire approach in general. Your sole desire becomes the need for recognition and power, even at the cost of crushing other people’s personalities. Weak to locate any form of amusement or distraction you become isolated and a disoriented individual. Chakra healing through meditation is your only chance of respite. This is the time when you need to control your emotions and stop feeling unnerved on any issues. Focus on the good deeds that you have performed in the past and strive to make a better person of yourself. You should experience the sweetness and the joys of life, and try to focus more on spirituality. This will help you augment from the current crisis that you may find yourself in, and make you a much-evolved person.